Saturday 30th March, after a freezing cold night, it must have been about -2 or -3, in a sleeping bag that is only just suitable for camping out in the summer. I woke up around 08:00 to glorious sun shine, although it was still bitterly cold. After getting a brew on and having grub, Me and Cameroon woken Drew from his sleep. From our camp site Modrydd farm (which I posted about earlier on), we started by following the river up the valley of Cwn Llwch. The further we ascended the more snow we encountered for obvious reasons, we enter the snow line at around 560m by my reckoning. Also, at the same time we saw a partly frozen Llyn Cwn Llwch. Ascending now in the snow we reach the memorial of 5 year old Tommy Jones, the story is that he got lost on August 4 1900 on his way to Cwn Llwch Farm, his remains where found in September 1900. There is an inscription on the memorial which reads, “This obelisk marks the spot where the body of Tommy Jones aged 5 was found. He lost his way between Cwm Llwch Farm and the Login on the night of August 4, 1900. After an anxious search of 29 days his remains were discovered Sept. Erected by voluntary subscriptions. W Powell Price Mayor of Brecon 1901.” Moving on from the memorial we have Corn Du 190m above us, giving us a reasonable climb to the summit. The last section was particularly hard, normally a step rocky outcrop now a ice and snow covered scramble. As we got to top the views simply blow us away; with being able to down to Pembrokeshire and the Bristol Channel to the south, while to the north the mountains of Mid Wales. While we where admiring the views we also notice the snake of people coming up from the Storey Arms, as well as, some very inappropriately dressed people including one group who were wearing jeans and trainers. Considering the conditions we felt we where under prepared without ice axes and crampons, with what they had on we were concerned for there safety considering it was still -3 and in the wind defiantly below -10. Photo by a random bystander. 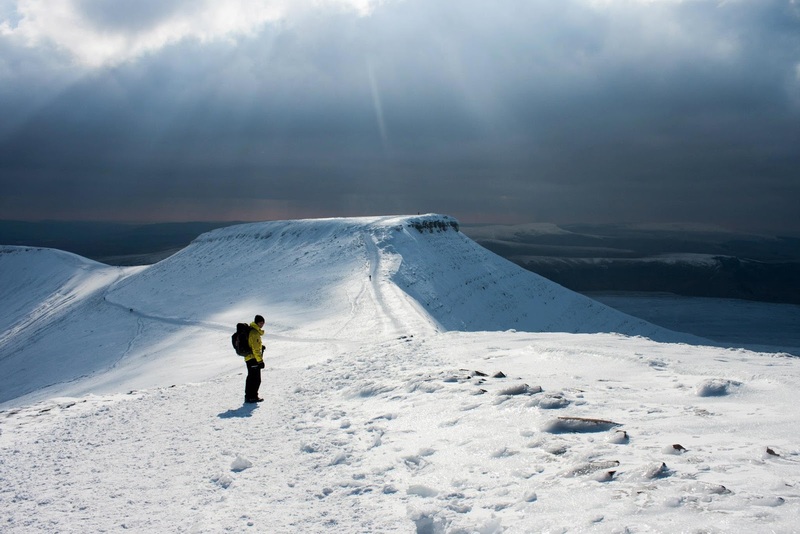 We left Corn Du and decned on to the saddle between Pen Y Fan and Corn Du, with more snow and ice as well as some slips and slides. This was also the first oppitunity that I had to see what my new Paramo Velez Light Adventure Smock (I will do a review on this in the near future) was like and I have to say I was very impressed it kept me very warm. We decided to have lunch at Pen Y Fan, which to our surprise there was wind at all despite being he highest point in the Brecon Beacons. We think that it was to do with the large crags on two sides. While having lunch we messed around with Drew’s camera and got pictures some of which are on the Photo Gallery page. We left Pen Y Fan and crept our way down an incredibly slippery section towards Cribyn. This took us quite a while as without an crampons it was mad in fact it was time to sit down and slide down on our backsides much to the amusement of some people. After a long decent to the head two of the valleys, we stopped and to watch some ice climbers on Pen Y Fan and a search and rescue helicopter fly around, not really sure what he was up to. We also reassessed our return route, as we could not pass under the main crag of Pan Y Fan due to the conditions like we had planned. Climbing up Cribyn was much the same as going up Corn Du only steeper. 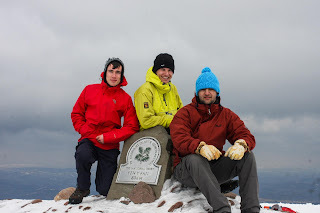 We reached the top of Cribyn at the same time as some locals who we had a nice chat with. Leaving Cribyn, me and Drew thought it would be a fun idea to to and slide down on the ice that had formed on top of the snow. Yeah brilliant idea, we slide about a metre before going through the ice in to knee deep snow, much to Cameroon’s amusement (he did not even get it on film!). After several tries of being muppets each ending in a similar fashion. Me and Drew got Cameroon back, yeah you got we pushed him in the snow only lightly and in to the powdery snow. Corn Du later in the day. The ascent back up Pen Y Fan was quite uneventful just a plod, up to the near the top before we tried to contour around the plateau which head in us having to turn back as the ice was pretty dangerous – I could not even get my pole through it. Annoyingly this forced us back to make the final ascent of Pen Y Fan. When we reached the top time was pushing on to around 15:00, so we pushed straight on not really wanting to get caught out on the mountain at night. It was a similar story all the to the memorial where the wind picked up to a ferocious speed, when we descend back down in to the valley. At one point in particular I slipped on some ice and was nearly blown down hill side not a nice feeling by any stretch of the imagination. We got back in to camp at around 16:30, with the sun shining and everyone still in high spirits. After some grub we just had a general relaxation, which involved listening to the radio and trying to get some pictures of the stars, which we failed in unfortunately. All in all it was a very good day out and we ready for more the next day.